Take I-84 exit 38. Head South on Garrity Blvd. and turn right on Flamingo Ave. We are located just behind Saint Alphonsus Medical Center. 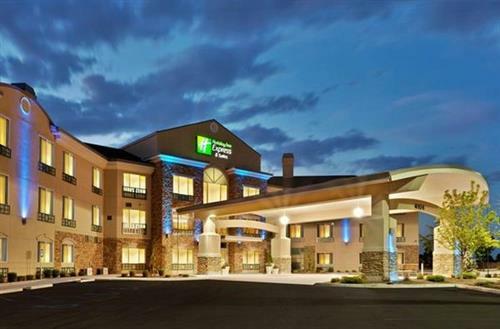 Enjoy a comfortable stay at the Nampa, Idaho, Holiday Inn Express Hotel, conveniently located just one mile from the Nampa Municipal Airport and 15 miles from the Boise Municipal Airport. Our Nampa, ID hotel offers shuttle service to the airport. Leisure travelers will enjoy lodging at our Nampa hotel, located off of Interstate 84 with access to Idaho attractions including Boise State University, family-friendly Roaring Springs Water Park, Wahooz Fun Zone, Boise Zoo, Lake Lowell and the Warhawk Air Museum. Other nearby sites include the Sawtooth Winery, Centennial & Ridge Crest Golf Courses and the Nampa Civic Center. Along with the close proximity to the Ford Idaho Center, our hotel is also near several local businesses such as the Gateway Shopping Center, Karcher Mall, Micron and Amalgated Sugar. With a convenient location, two large meeting rooms and 24-hour Business Center, you'll be able to finish the job at our Nampa hotel. During your visit to our hotel in Nampa, Idaho, enjoy premium amenities that include free WIFI & high speed internet access (HSIA), an indoor heated pool, fitness center and a hot complimentary breakfast bar that features our signature cinnamon rolls. Book your reservation now, and enjoy our great hotel deals and rates.